Singaporean Ambassador Heng Chee Chan has spent eight years in Washington as a diplomat and has been an integral part of Washington society. As honorary chair of the Choral Arts Society's annual benefit, Ambassador Chan has proven that she is a patron of the arts as well. The ambassador sat down with Washington Life's editor in chief, Nancy Bagley, to talk about Singapore and her time in D.C.
Washington Life: You are this year's honorary chair of the Choral Arts Society's annual benefit, “Christmas in Singapore,” and you have been extremely generous with the flowers, gift bags and VIP reception as well as with auction items, a dinner for 27 and a trip to Singapore. Are you a great fan of the arts? Do you sing? H.E. 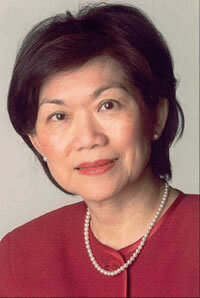 the Ambassador of Singapore Heng Chee Chan: I love music and the arts generally. I have always thought a person is not complete without this dimension. I grew up going to Cantonese opera with my family. The first time I heard the Choral Arts Society was when they sang Fauré's “Requiem.” They are very good. WL: What do you wish to achieve while in Washington? HCC: I have been in Washington for 8 years. When I arrived in Washington, there was still an issue between the United States and Singapore over the caning of a young American. We have gone past that issue now and I have been able to focus on more productive projects. We have enormous shared interests in security, political and economic cooperation. Singapore and the U.S. completed the U.S.-Singapore Free Trade Agreement in 2003. We are supportive of the U.S. as a member of the coalition for the immediate disarmament of Iraq and we are working together on counter-terrorism. We are also negotiating a Strategic Framework Agreement on defense cooperation. I think the U.S.-Singapore relationship has never been better. I am glad this has happened during my stint. WL: There is much ethnic diversity in Singapore, although Chinese are the predominant majority. Can you provide a bit of a background of the religious and cultural mosaic for our readers? HCC: The Chinese make up 75% of the population, Malays 15% and Indians 8%. Singapore's population is 4 million, of which about 800,000 are residents and expatriate workers. Singapore is multi-religious. Most Singaporeans are of a Buddhist/Chinese adherence, which is a mixture of Taoism, Confucianism and Buddhism. The Malays are Muslims and the Indians are generally Hindus with some Muslims and Christians. The Christians make up about 15% of the population and they are primarily Chinese and Indians. Because Singapore is an immigrant society of ethnic groups, we have a great pragmatism to accommodate other cultures. Singapore has four languages – Malay, English, Chinese, and Tamil. English is the common language. It is the language of the Civil Service, the schools, the universities, and of the commercial and corporate sectors. WL: In countries such as Saudi Arabia and Egypt, the government supports the U.S. but the majority of the populations are far more critical. Do the people of Singapore support the U.S.? HCC: Singapore is located in the third largest Muslim region [in the world], with 250 million Muslims. Fifteen percent of our population is Muslim, so certainly at the street level the Muslims are not happy and there are some non-Muslims, too, who are critical of the U.S. But overall I would say the United States is well received in Singapore. Despite those criticisms, we see the United States as the country to study in and do business with. WL: What about the North Korea situation? WL: It sometimes seems that the extremist minority on all sides are controlling the agenda and pulling us all in. HCC: Definitely. In Southeast Asia most of the Muslims are moderate. Our greatest chance of winning the hearts and minds of Muslims is in Southeast Asia. Southeast Asia will be a bridge to other Muslims. Southeast Asia is a very relaxed region but increasingly the Muslims are getting radicalized. The point is, if you have a [small] core of dedicated militant Jihadists it can create a great deal of trouble for everyone. WL: Can you highlight some reasons why American tourists should visit Singapore? HCC: Singapore is one of a kind. It is worth a visit and is the most modernized and westernized country in Asia. The ethnic groups live in harmony and it is a fascinating experiment. Singapore is also efficient, yet people are warm and friendly. We offer a clean, green environment and the best food [in the area] at a reasonable cost. WL: Are there a lot of women in the government? HCC: They do well here [but] I was the first woman from East Asia to be the permanent representative at the United Nations when I went in 1989. When I arrived [in Washington] I was the first woman ambassador appointed from East Asia. WL: What did you do before becoming a diplomat? HCC: I was a professor at a University. I'm antiestablishment and was a bit of a dissident before I was appointed ambassador. It came as something of a shock to me when I was offered the ambassadorship because I was highly critical of government in a society that is not used to being critiqued. WL: Do you think they gave you a position to keep you quiet? HCC: I don't know, but I don't think so. I think my government realized that the pieces I wrote were never personal against any leader. It was always policy. WL: Where do you see Singapore's economy going in the next ten years? HCC: Singapore has been pushing the envelope for a small state. Our economy is based on manufacturing, services, communications and commerce. We are strong in pharmaceuticals and are developing the biotech industry. I think services will still be our strong point because of our transparency and rule of law. WL: Is there anything we should be mindful of while traveling there? HCC: You can be quite relaxed in Singapore but you have to be careful not to spit and drug use has a mandatory [jail] sentence. Drug trafficking has a death penalty sentence. WL: You've been here for eight years, a lot longer than ambassadors usually stay. Do you think you're going to stay much longer? HCC: Probably not. I love living here but it's important to have renewal [new energy] and I have said that to my government. WL: What will you miss the most? HCC: America is easy to adjust to, which I think is why so many immigrants find it inviting—that's your greatest strength for a prosperous America. What I will miss most are the conversations, the tone of the conversations, and the quality of the conversations [in Washington]. When you go to dinner parties, the conversations are about issues and ideas. I most admire the American spirit of philanthropy, volunteerism and caring about a cause [whether it be] helping the arts, the poor, or abused women. I'm resolved to bring the philanthropic spirit and ideas back to Singapore.